Published November 16, 2011 By Anna T. This post may contain affiliate links. Regardless, I only recommend sites I've researched and/or used and trust. Scribendi is an editing and proofreading company based out of Canada. They have been around since 1997, hiring work from home proofreaders and editors. Something like this might be ideal for you if you're good with words but want something to do either in addition to or instead of writing jobs. It's important to note however that this company does require you have some experience with editing, proofreading, or a related field and also a college degree. How much does Scribendi pay? There is no information on the website about how much they pay, so it might not be something they want to reveal. However, Glassdoor reveals a few salaries for editors at Scribendi — $25 an hour! I also looked over some reviews from Scribendi editors. These indicate that ultimately, your pay rate is dependent on how fast you can edit the documents. While many of their editors do earn $20+ an hour, others earn around $15 or even less. You can potentially get faster as you learn the ropes. Related: FREE workshop teaching you all about starting your own online general proofreading business! 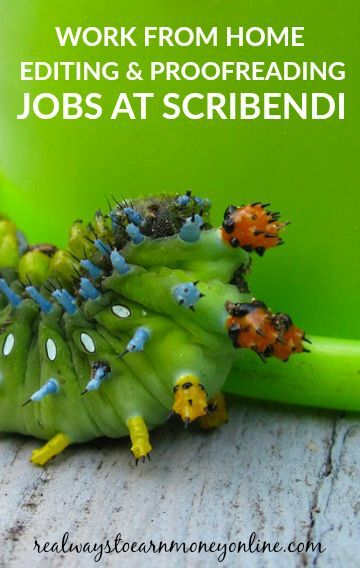 Can anyone in the world work for Scribendi? Yes, they hire workers worldwide for proofreading/editing positions, but English has to be your first language. What are the educational requirements to be considered for employment? Scribendi is looking for people with a college diploma or university degree in a related field. However, a graduate degree is preferred. It's also important that you've had at least three years of experience in editing, writing, document production, or teaching languages. Does Scribendi hire you as an employee? No, Scribendi hires their telecommuters (work from home employees) as independent contractors. To apply, you have to fill out their online application and also upload your resume. You will only hear back from Scribendi after applying if they are seriously considering you for the job. If you hear back, you'll have to take a test to prove your skills. I've read that the test is a little difficult. They keep applications on file for six months, so if you don't hear back within that time frame, you can reapply. Is work consistent at Scribendi? They say that they cannot guarantee you a set amount of work to do so the amount you get will likely vary. What do current and former workers say about editing for Scribendi? The reviews are mixed, with Scribendi getting an overall 3.2 of 5 starts on Glassdoor. While some workers love the flexibility, management, being able to pick and choose orders from a large pool, others got disgruntled pretty quickly. I've seen multiple complaints about having to edit papers where English is not the first language of the writer, and essentially having to re-write the document. When this is the case, apparently it is not worth the money because the work is project-based. There were also some complaints about management — management expecting too much, short turnaround times, etc. Feel free to go to Glassdoor and read through Scribendi's reviews yourself to get some more details. Where do you go to sign up for Scribendi? You can go here to apply. Would you rather work for yourself as a proofreader and make MORE money? FREE court transcript proofreading 7-day e-course – Learn how to proofread court transcripts from your iPad. Caitlin Pyle actually earned over $40,000 in one year doing this from home! FREE 45-minute workshop (also from Caitlin Pyle) explaining how to go about starting your own freelance general proofreading side hustle from home. Good luck in whatever you choose to pursue! Hi, I work at Scribendi. We pay our telecommuters 50% of the price of the order. Thanks! I just got my feet wet with proofreading. I’m going to give this a shot.